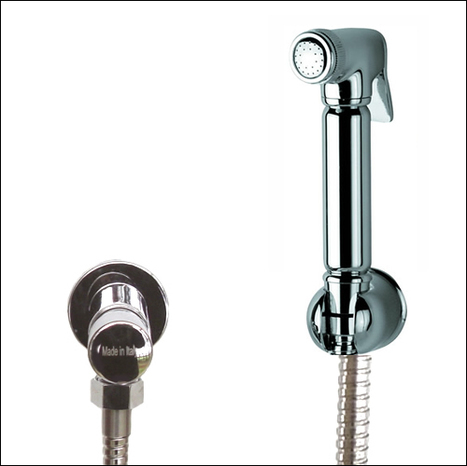 BRA6400: Comprises BRA4000 Italian chromed brass bidet shower with stainless steel hose and wall mounting bracket and for added peace of mind against accidental leakages the VAL2300 temporised automatic shut off water isolating valve. BRA6400: Optimum Quality Bidet shower with automatic shut off valve. BRA4000 Shower head, hose and wall bracket. Basic installation information available by clicking the Installation Guides. We strongly suggest you turn off yor bidet shower after Each use at the mains valve on the integral mount supplied with this kit, this not only extends the life of the shower and hose but also safeguards against accidental spillages.